Snagging a marriage proposal for her client while on an all-expenses-paid vacation should be a simple job for Ciel Halligan, aura adaptor extraordinaire. A kind of human chameleon, she's able to take on her clients' appearances and slip seamlessly into their lives, solving any sticky problems they don't want to deal with themselves. No fuss, no muss. Big paycheck. This particular assignment is pretty enjoyable...that is, until Ciel's island resort bungalow is blown to smithereens and her client's about-to-be-fiancé is snatched by modern-day Vikings. For some reason, Ciel begins to suspect that getting the ring is going to be a tad more difficult than originally anticipated. Going from romance to rescue requires some serious gear-shifting, as well as a little backup. Her best friend, Billy, and Mark, the CIA agent she's been crushing on for years—both skilled adaptors—step in to help, but their priority is, annoyingly, keeping her safe. Before long, Ciel is dedicating more energy to escaping their watchful eyes than she is to saving her client's intended. 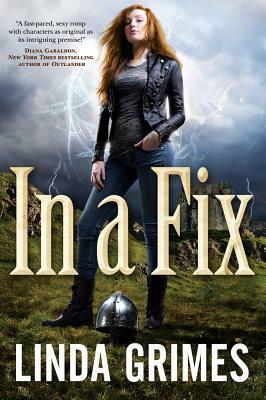 LINDA GRIMES is the author of In a Fix and its sequel Quick Fix. A former English teacher and ex-actress, Grimes now channels her love of words and drama into writing. She grew up in Texas and currently resides in northern Virginia with her husband.